The main avian predator of the moa was the gigantic Haast’s eagle (Harpogornis moorei), with a wingspan of about 3 metres. When Polynesians arrived, the eagle was very much alive, and possibly carried off a few of their number. 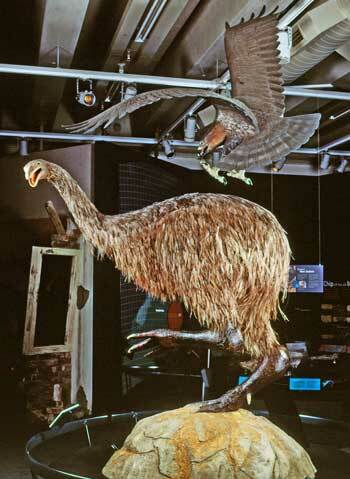 By 1400 AD large areas of South Island forest were burned off, reducing the habitat of the eagle’s prey; like the moa, it eventually became extinct. In 1872 one Māori told the former New Zealand governor George Grey that the eagle had been known as the ‘hōkioi’, after the sound of its cry, and that it was ‘seen by our ancestors’.